Dorothy Buckley Jones (Huck) was born in 1931. She worked for Revenue Canada. She died in May, 2003. Prior to their transfer to the Guelph Public Library Archives the records were in the custody of Ken Laufman. Fonds consists of photographs, textual records and objects collected or accumulated by Dorothy Huck. Included are photographs of Dorothy Huck, and certificates from the Guelph Kiwanis Music Festival and the Stratford Music Festival, and a notebook marked Loretto Academy. 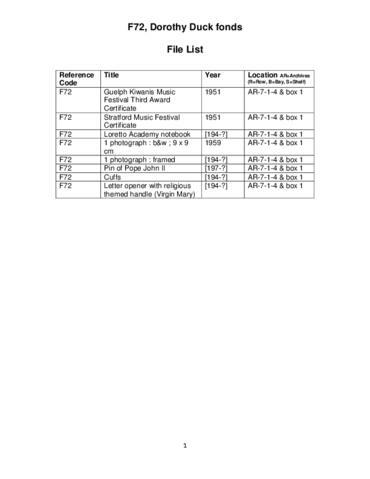 To access these records, consult file list F72 to identify specific files for viewing. Order box 1, Dorothy Huck fonds, from the Guelph Public Library.